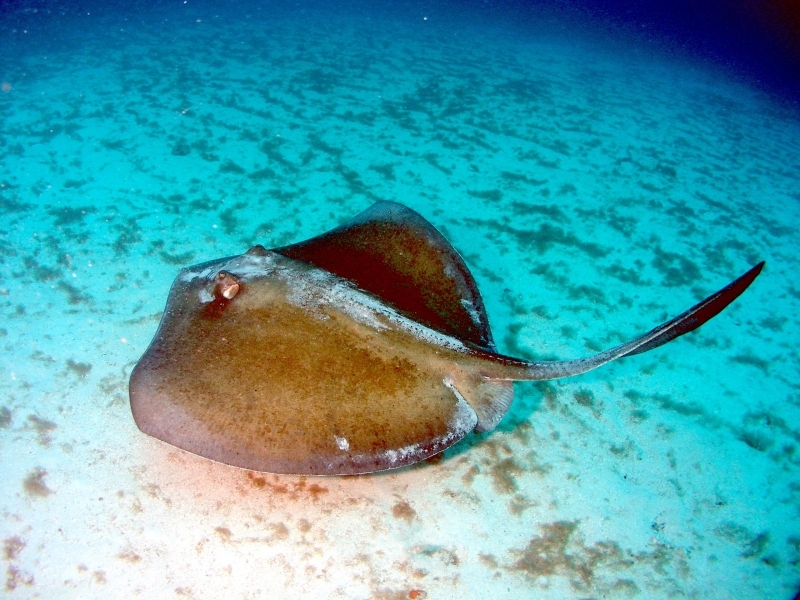 The Southern Stingray is an active swimmer that feeds primarily at night, on a diet of invertebrates and small fishes. 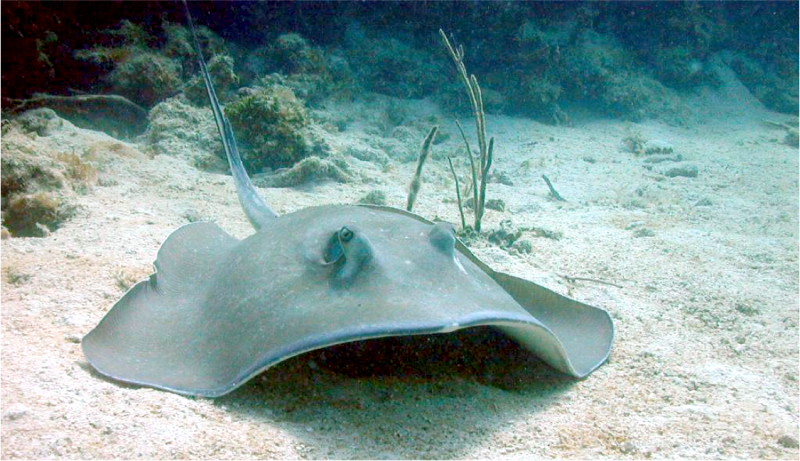 They feeding by flapping their wing-like pectoral fins to disturb the sand and expose their prey. 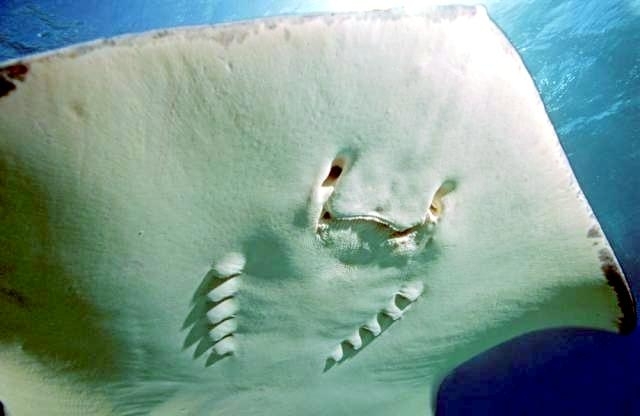 A Southern Stingray on November 17, 2006, jumped into a fishing boat in Florida and stabbed 81-year-old James Bertakis in the chest who died from his injuries later that day. 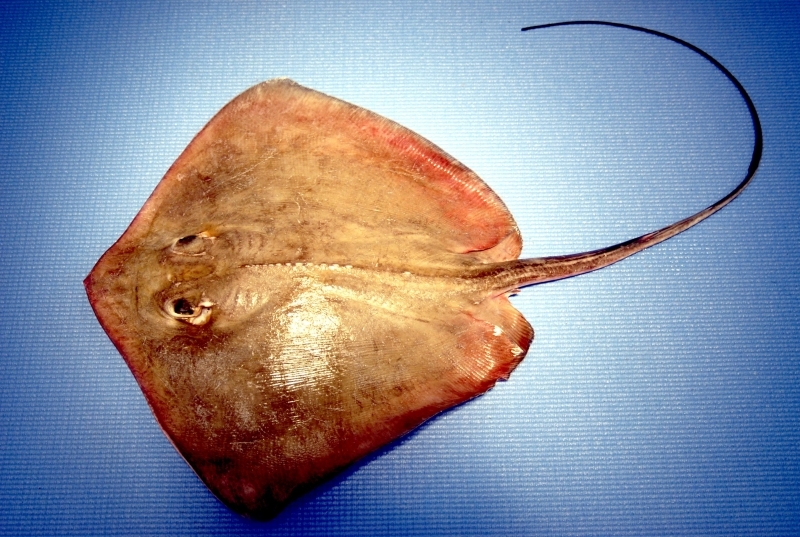 This bottom-dwelling species is often found singly or in pairs, except in the summer months when it migrates in schools to higher latitudes. 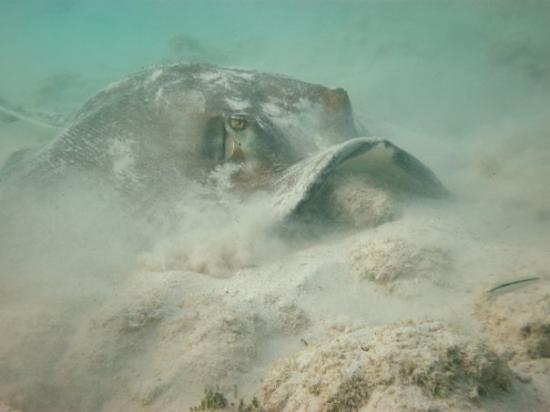 Very little is known about the natural mating behavior & reproductive biology of the Southern Stingray. 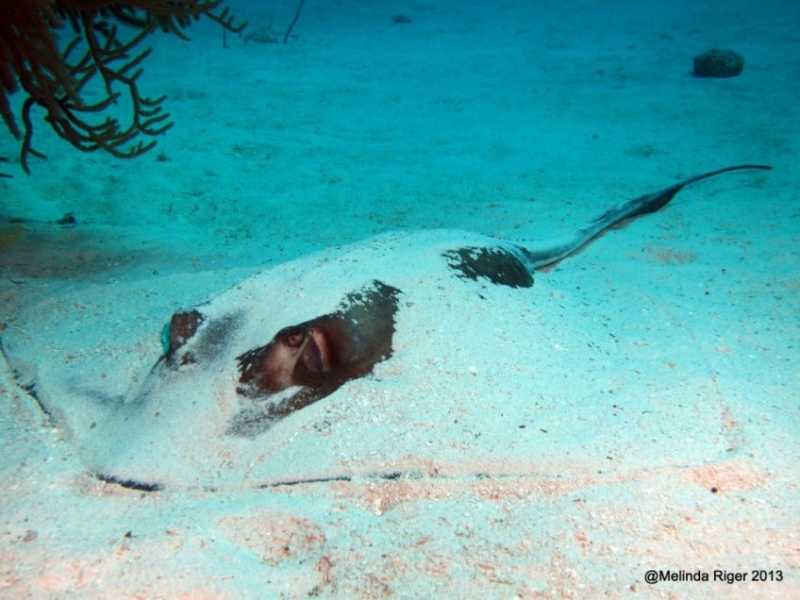 Mating stingrays are rarely encountered in the wild. 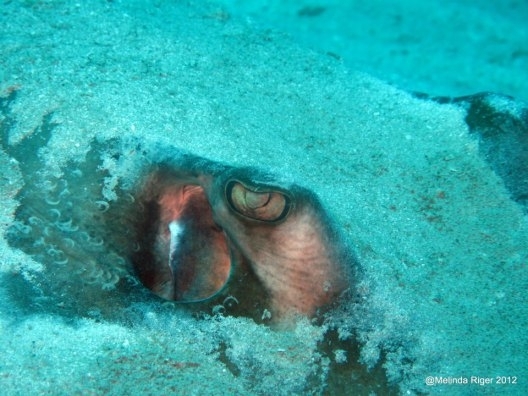 During one such rare occasion, the male was observed closely following the female and then biting her before grasping the female’s pectoral fins with his mouth and then copulating. 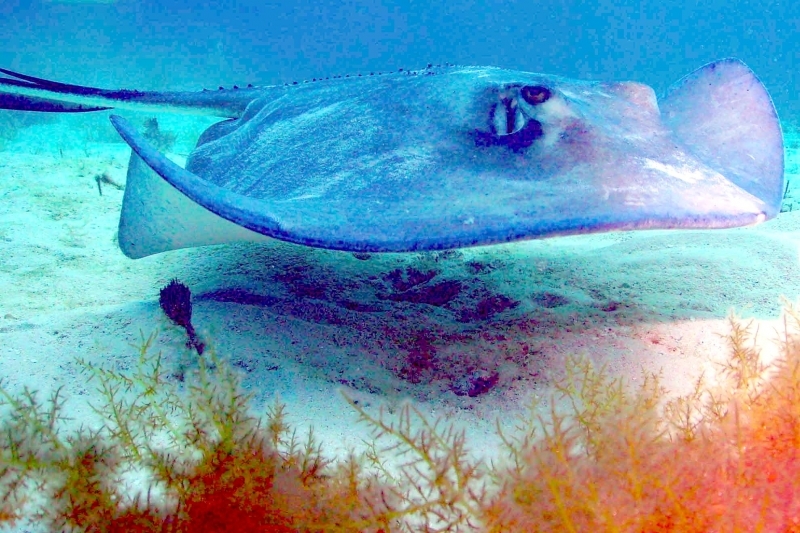 It is thought that Southern Stingrays are polyandrous, as a female was observed mating with 2 males in quick succession. 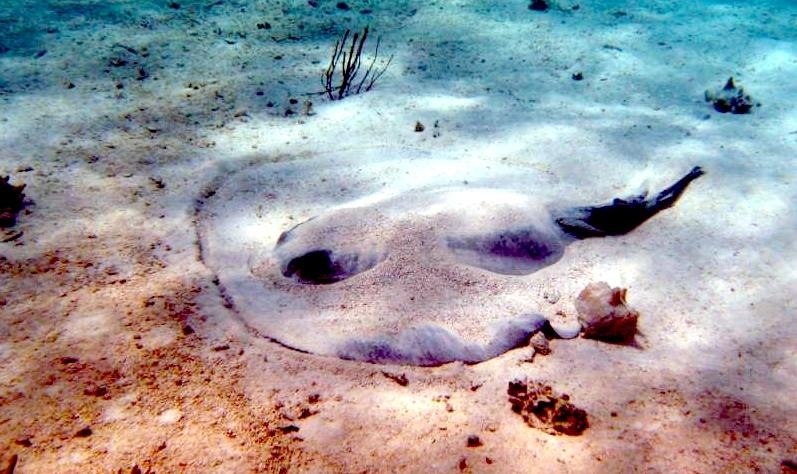 The Southern Stingray is ovoviviparous, a method of reproduction in which the egg develops within the female’s brood chamber. The pups hatch from their egg capsules inside the mother and are born soon afterwards. 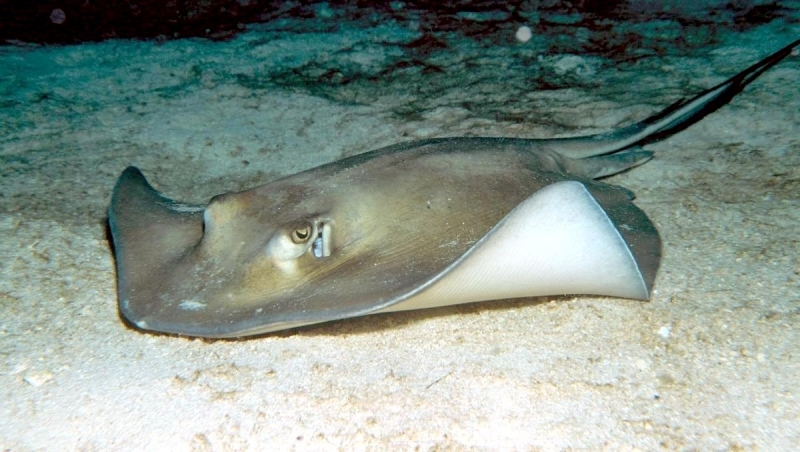 In captivity, gestation lasted 135 to 226 days after which a litter of 2 to 10 young were born. 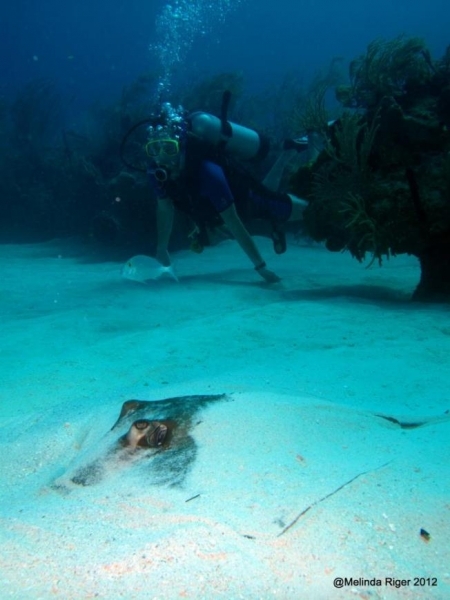 Southern Stingrays can be found in the tropical & subtropical waters of the western Atlantic Ocean, the Caribbean, the Gulf of Mexico and down the coast to southeastern Brazil. 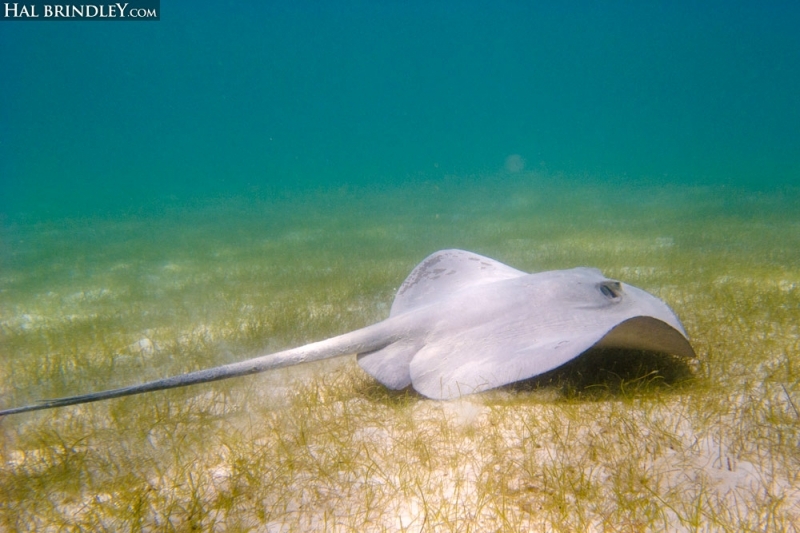 They make their home in shallow coastal waters to a depth of 180 feet and prefer lagoon or coral reef habitats where there are sandy bottoms & sea grass beds. 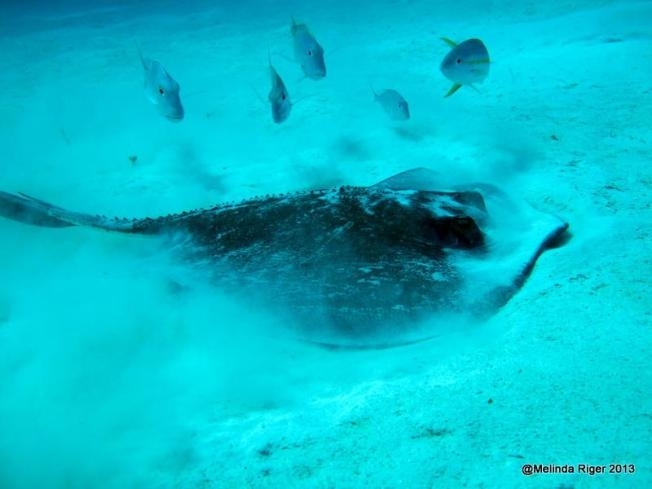 They feed on shellfish, worms, shrimp, crabs and small fish along the sandy ocean bottom. 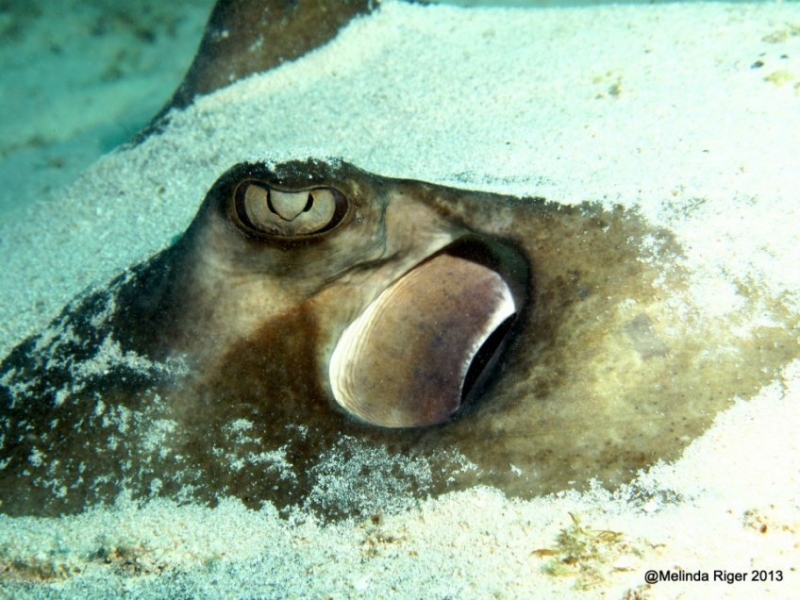 To locate their food, they use electroreceptors on their snouts as well as their excellent senses of smell and touch. 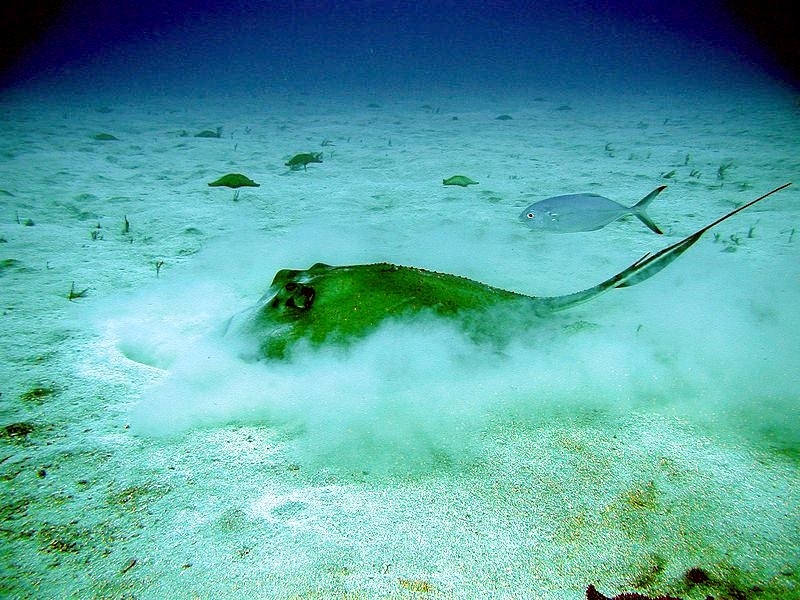 Then they uncover prey by blowing water out through their mouth and flapping their “wings” over the sand. 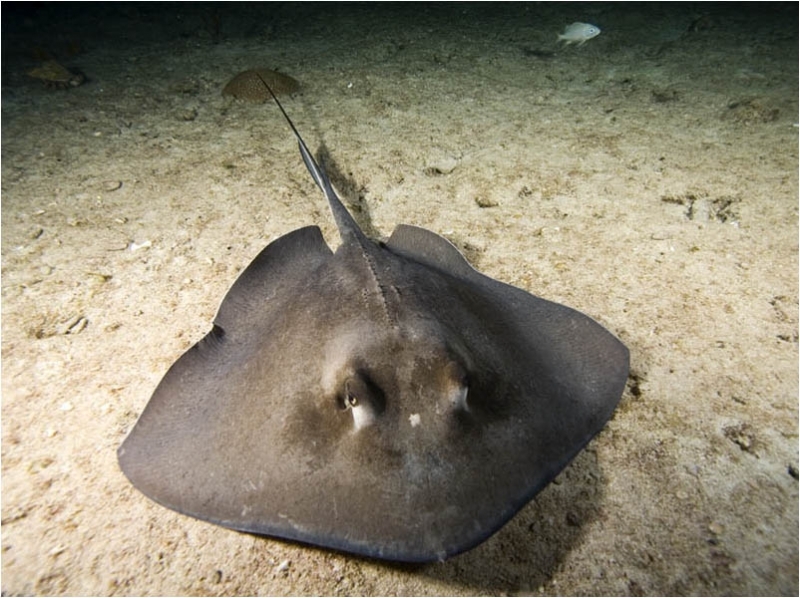 Other species of fish are known to follow the Southern Stingrays as they feed because they stir up extra bits of food as they go. 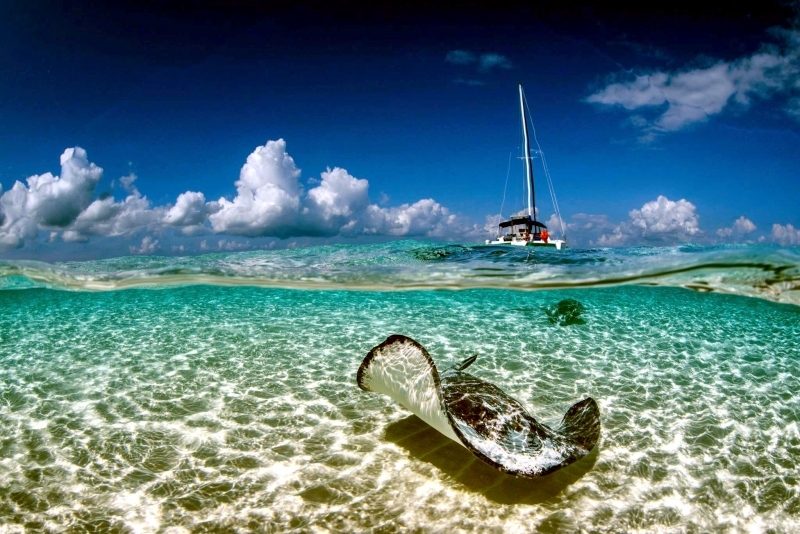 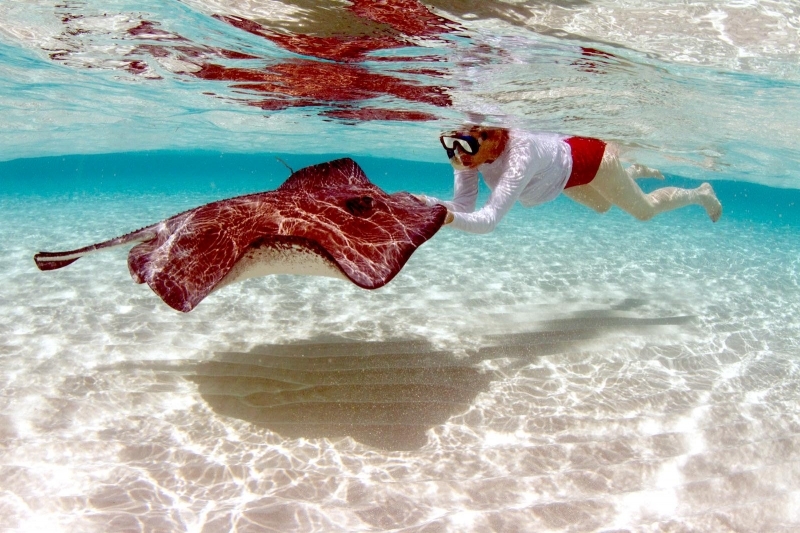 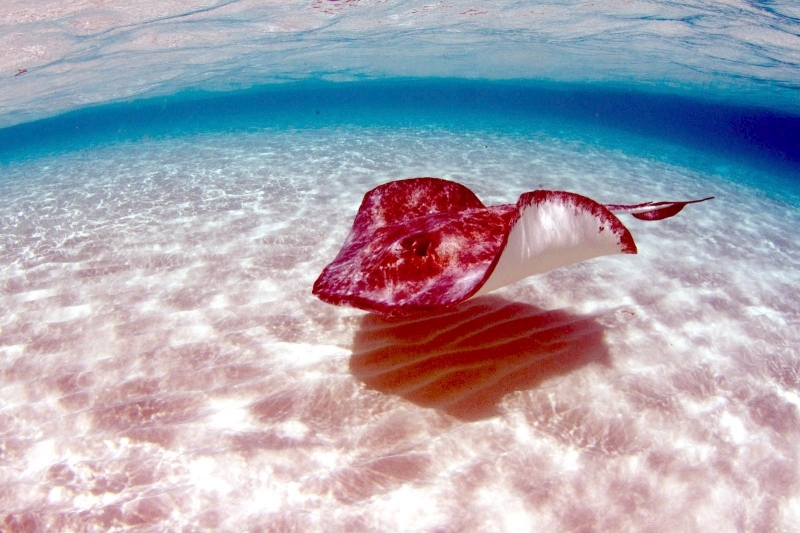 The Southern Stingray is adapted for life on the sea bed. 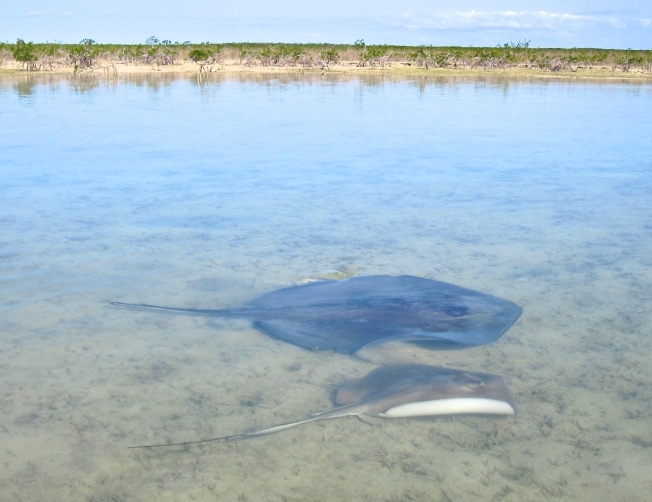 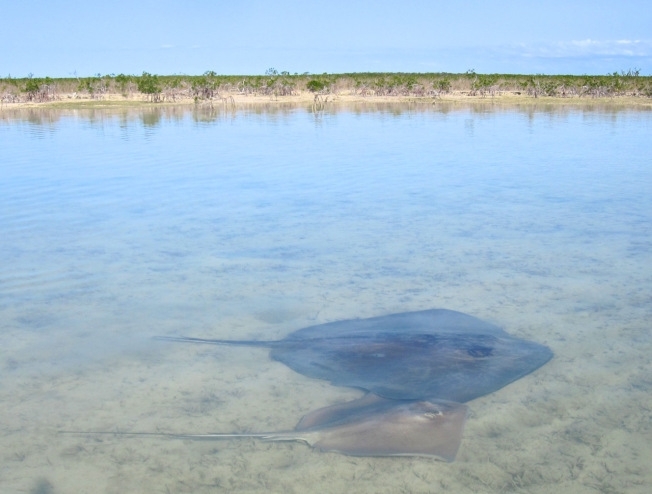 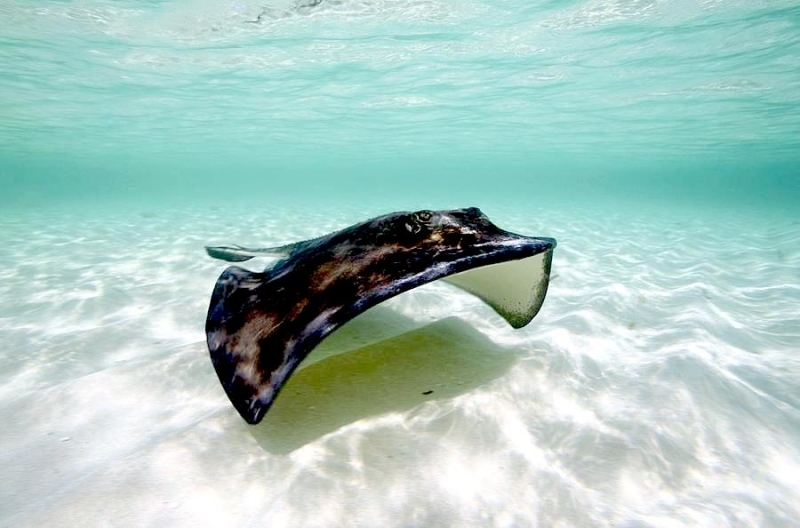 The flattened, diamond-shaped body has sharp corners, making it more angular than the discs of other rays. 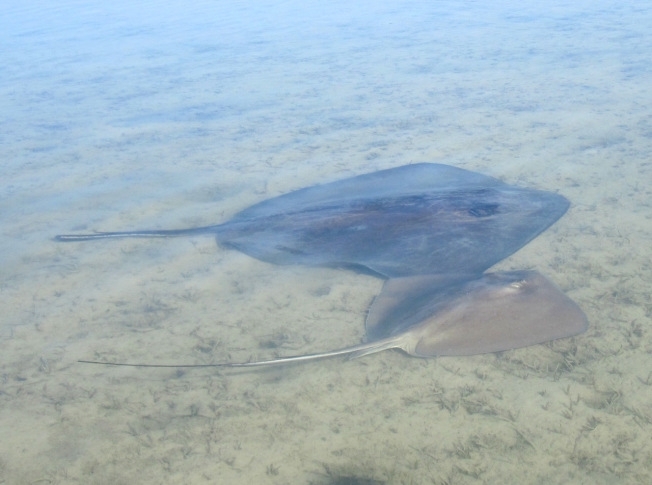 The top of the body varies between olive-brown & green in adults, dark grey in juveniles, while the underside is predominantly white. 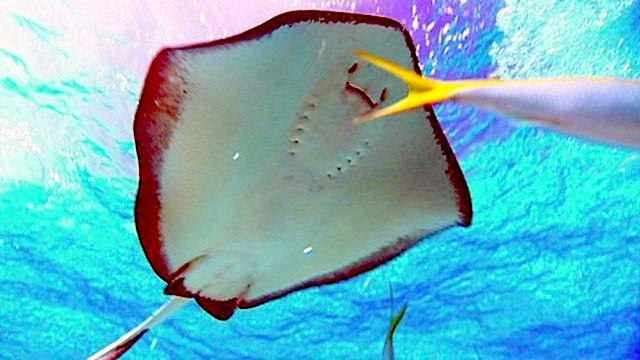 The wing-like pectoral fins are used to propel the stingray across the ocean bottom, while the slender tail possesses a long, serrated and poisonous spine at the base used for defense. 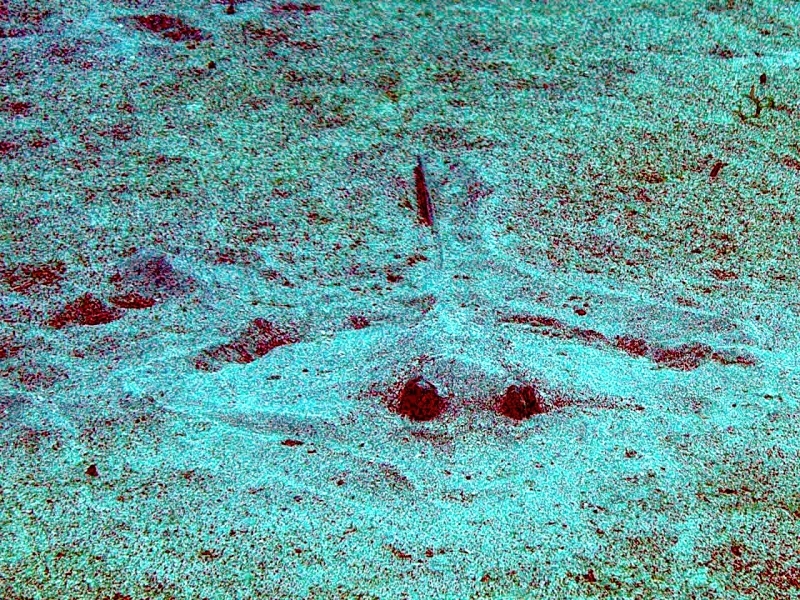 These spines are can be fatal to humans on the rare occasion and are incredibly painful if stepped on. If the Southern Stingray loses one of its barbs while defending itself, it immediately begins to grow a new one. 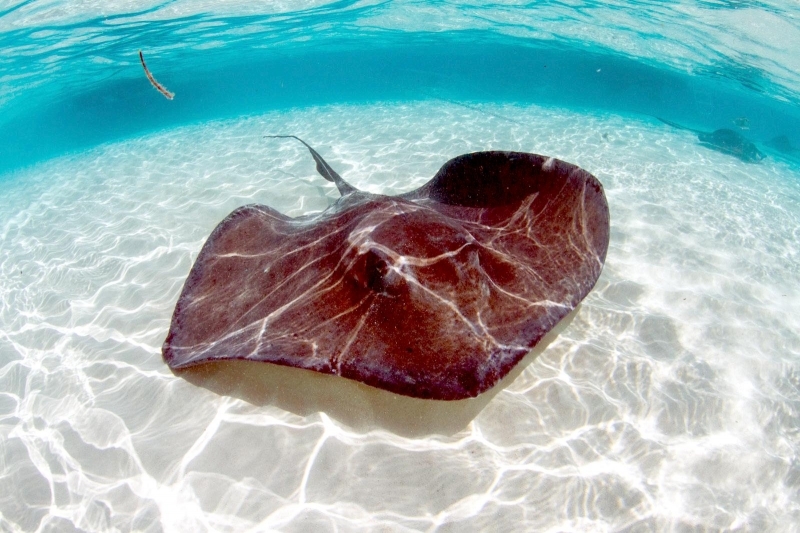 Stingrays shed & re-grow their spines on a regular basis regardless of whether they use them. 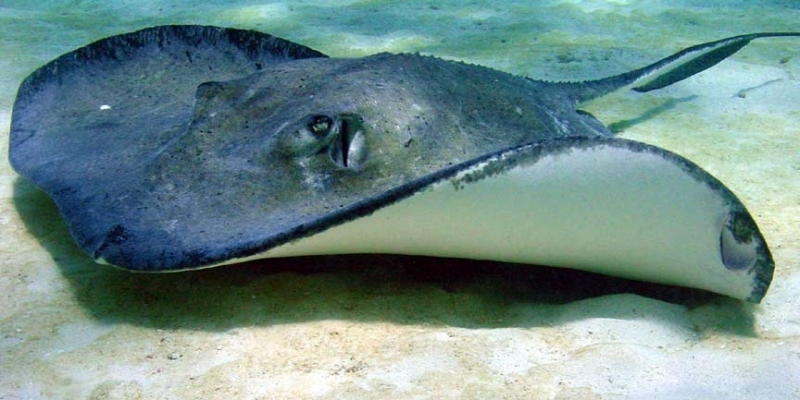 The eyes are situated on top of the head of the Southern Stingray, along with small openings called spiracles. 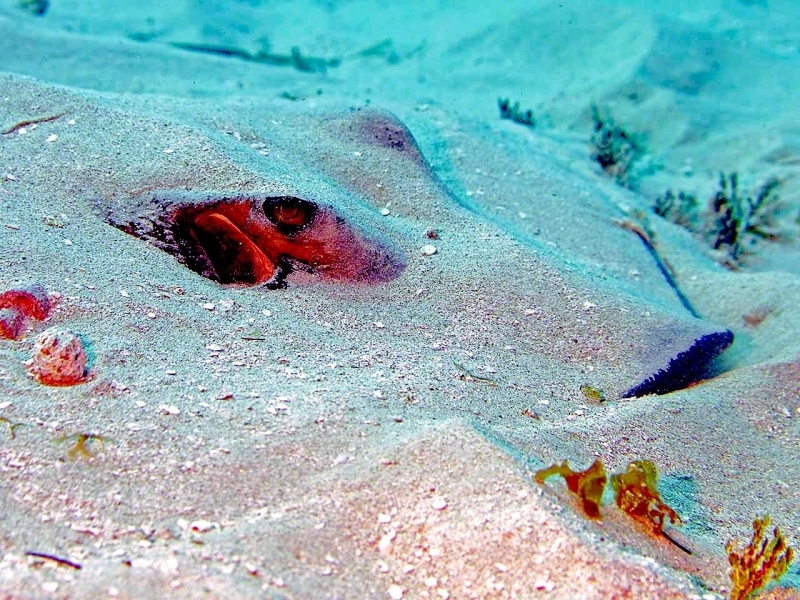 The location of the spiracles enables an individual to take in water while lying on the seabed or when partially buried in sediment. 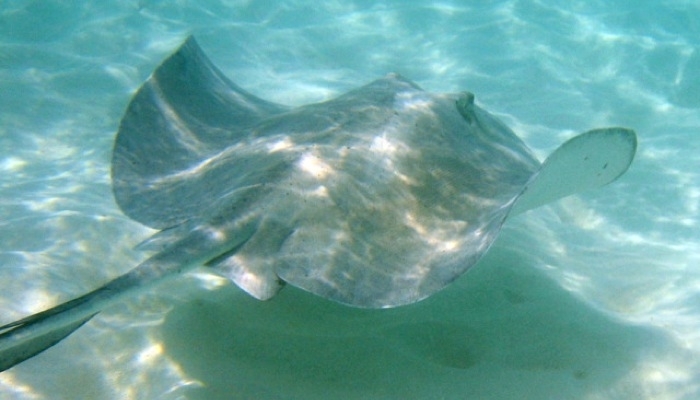 Water enters the spiracles and leaves through the gill openings, bypassing the mouth which is on the underside. 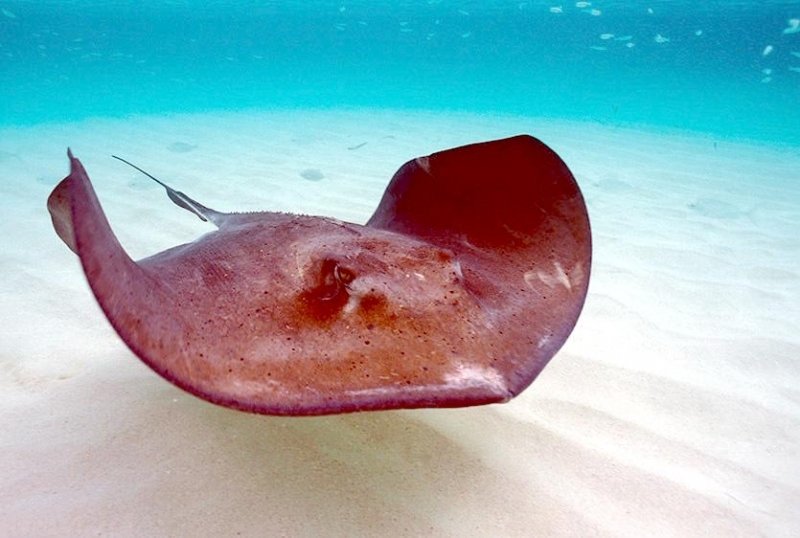 Southern Stingrays are known for their stingers, but they are actually very docile creatures. 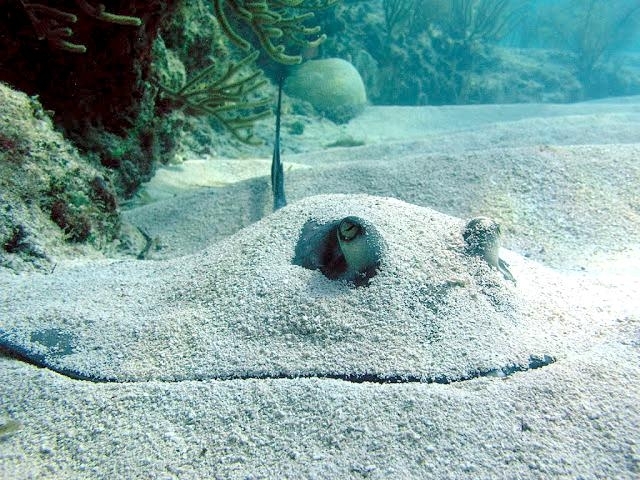 When not feeding, Southern Stingrays bury themselves in the sand with only their eyes & spiracles visible. 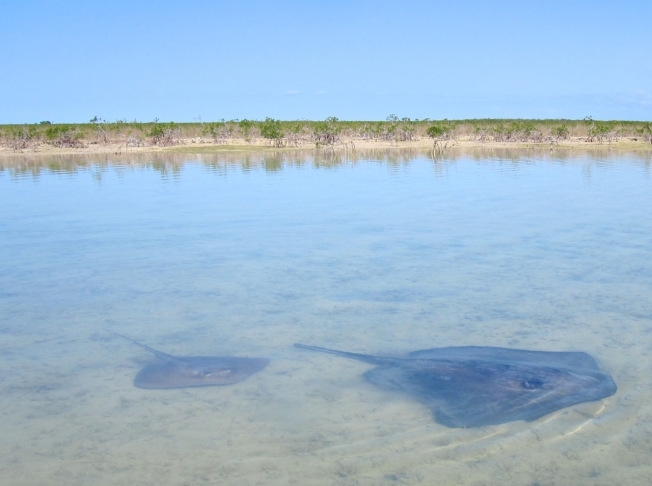 They can be found individually, in pairs or in loose groups. 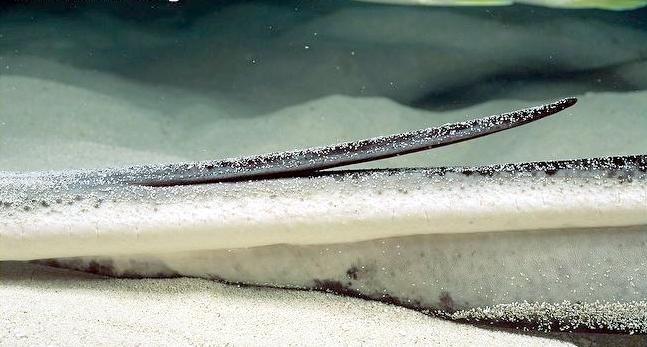 If threatened, they can raise their tails like a scorpion and stab predators with their venomous barb. 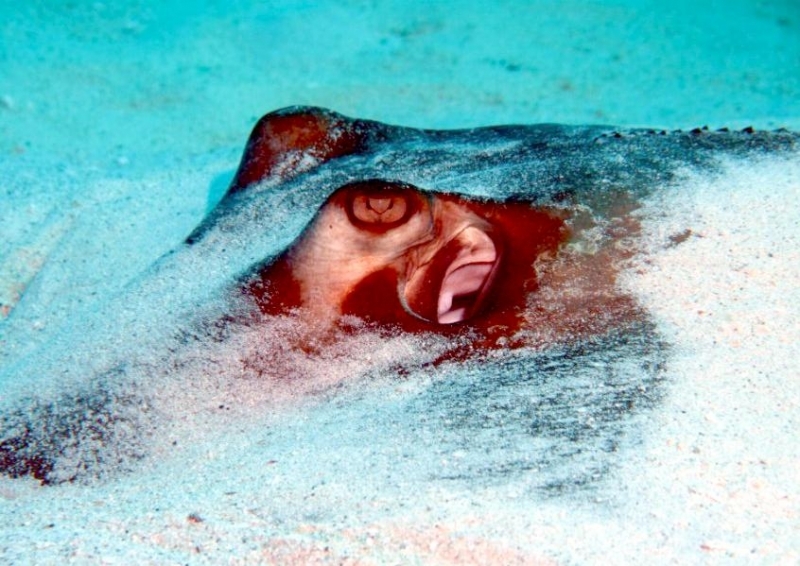 However, they are more likely to swim away from predators. 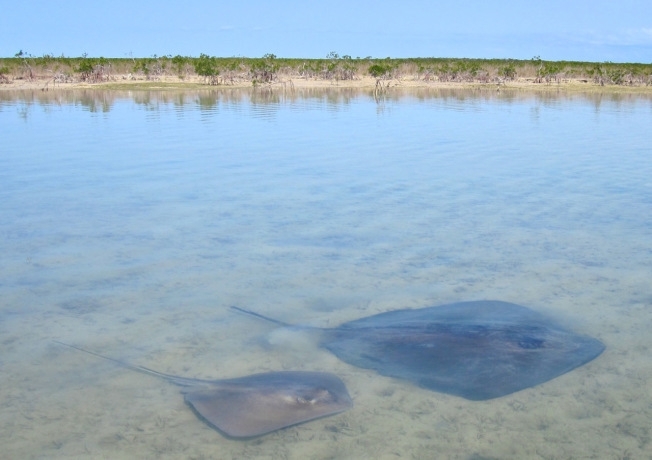 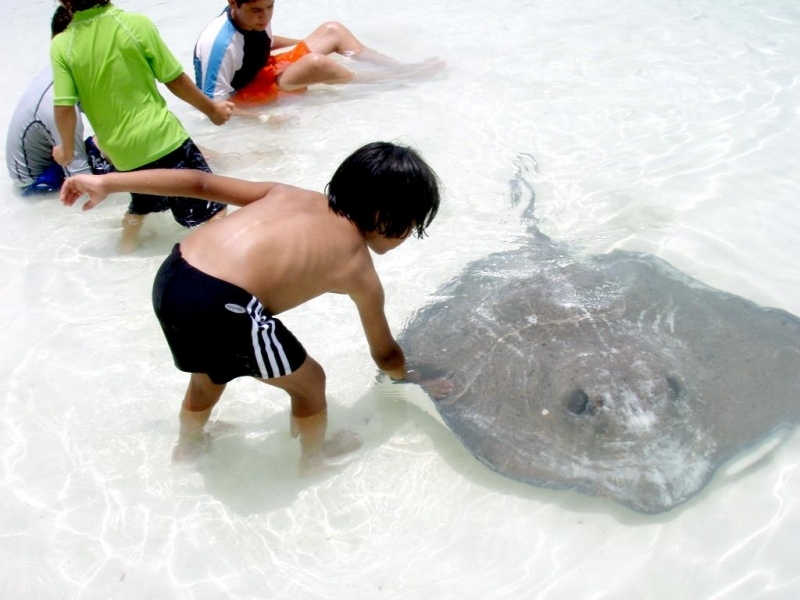 Southern Stingrays are considered by most experts to be docile creatures, only attacking in self-defense. 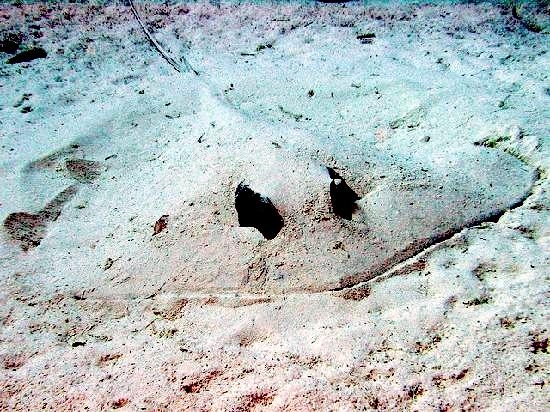 These stingrays are known to visit “cleaning stations” where smaller fish such as the Blue-head Wrasse or Spanish Hogfish will pick & eat parasites and mucus off of their bodies.